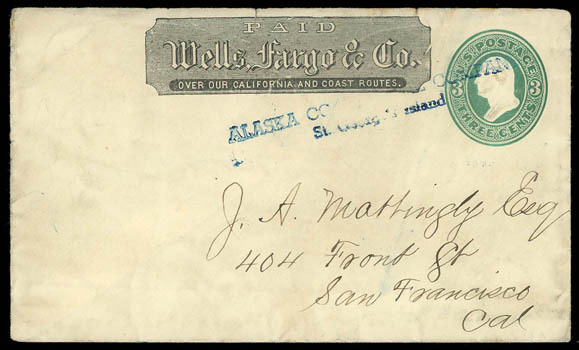 Alaska Commercial Company / St. George's Island, circa 1878 two-line blue company handstamp cancels 3¢ green entire with Wells Fargo Express printed frank to San Francisco Cal. ; partial flap and tiny edge tears at top, Very Fine and rare early use. AN EXTRAORDINARY EARLY AND RARELY SEEN ALASKA COMMERCIAL COMPANY CARRIED LETTER FROM ST. GEORGE'S ISLAND, ALASKA TO SAN FRANCISCO. 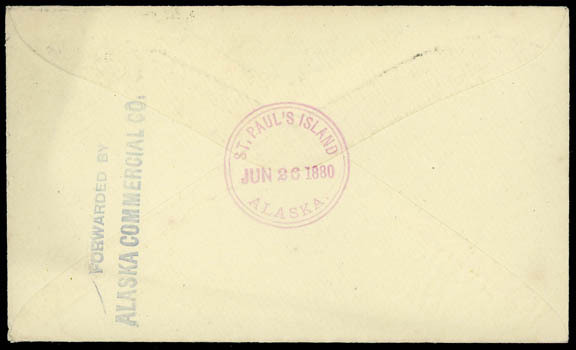 St. Paul's Island, Alaska, Jun 26, 1880, purple cds and matching flap seal strike on 3¢ green on lemon entire to Pomfret Vt., reverse with blue two-line "Forwarded By / Alaska Commercial Company" backstamp, docketed "Pomfret, Jul 19th, 5 P.M." at center; lower right corner flaw, fresh and Very Fine. A RARE EARLY ALASKA COMMERCIAL COMPANY CARRIED LETTER FROM ST. PAUL, ALASKA. 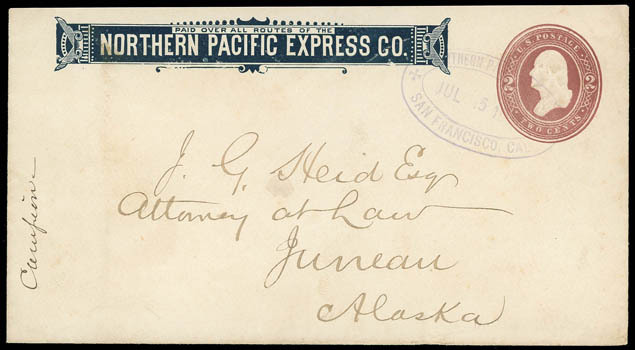 Express Mail to Juneau, Alaska, pair of circa 1887 north bound covers to Juneau Alaska, first 2¢ entire with printed Northern Pacific Express Co. frank and cancelled by purple "Northern Pacific Express, San Francisco, Cal. Jul 15" oval datestamp to J.G. 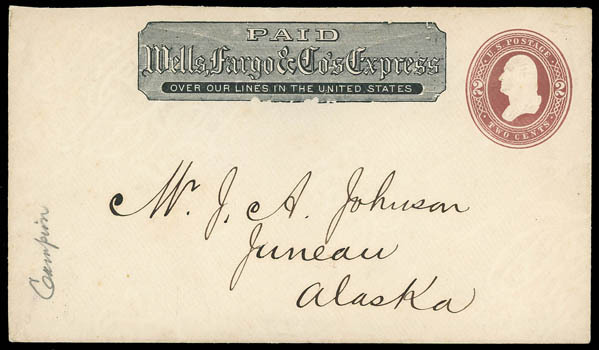 Heid, Juneau, Alaska; other uncancelled 2¢ red brown entire with Wells, Fargo & Co. printed frank addressed to Mr. J.A. Johnson, Juneau, Alaska, a Very Fine and scarce pair. 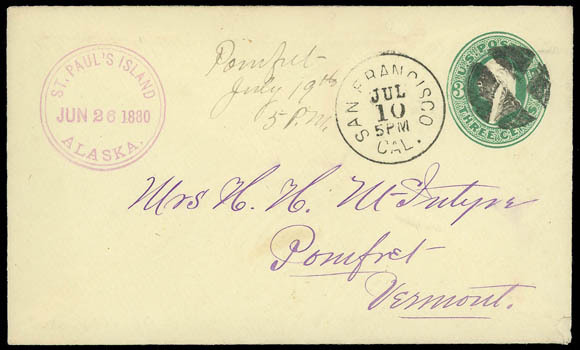 Alaska Commercial Co., Kodiak, - Alaska, Aug 13 Rec'd, bold purple oval backstamp on 1888 cover to West Randolph Vt. bearing 2¢ green (213) tied by circular grid, matching "San Francisco, Cal. F.D. Recd. Aug 27" cds with "Ship" circular and "U.S. 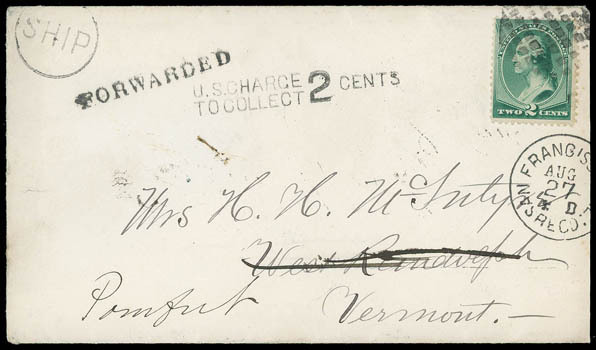 Charge to Collect 2 Cents" due handstamps; West Randolph Rec'd (9.3.88) backstamp and matching "Forwarded" straightline handstamp to Pomfret, Sep. 4th arrival backstamp, Very Fine. 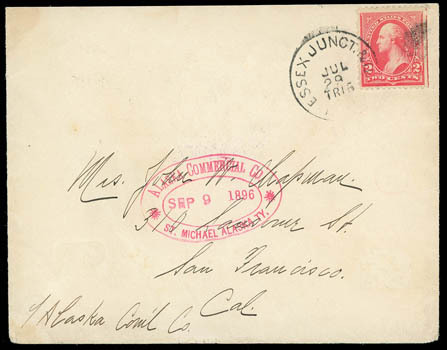 Alaska Comm'l Co., St. Michael, Alaska, Sep 6 1890, magenta oval backstamp on stampless cover to Middlebury Vt, "San Francisco, Cal. F.D. 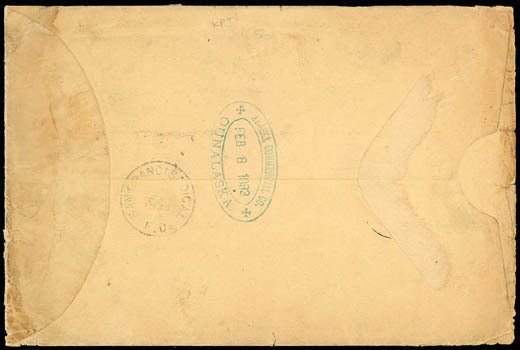 Nov 29 1890" transit backstamp and matching "Ship 4" due rating handstamp, partial Middlebury arrival backstamp, pencil "Aug. 27, 1890" notation at top right; reduced slightly at right, Very Fine. Alaska Commercial Co., Str. 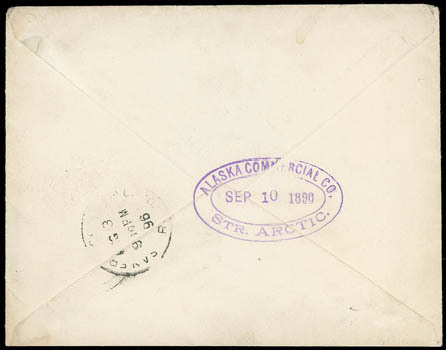 Arctic, Sep 10 1890, purple oval backstamp on north bound cover to Alaska addressed in care of Alaska Commercial Co. San Francisco bearing 2¢ Bureau issue tied by Essex Junct. R.P.O. Jul 29th duplex, San Francisco (8.3) transit backstamp, magenta "Alaska Commercial Co., St. Michael Alaska Ty. 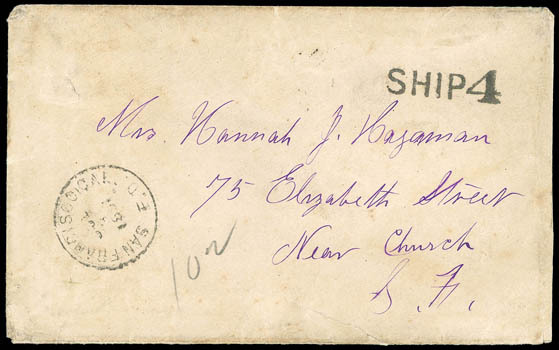 Sep 9 1896" oval handstamp, Very Fine. THIS IS THE ONLY RECORDED EXAMPLE OF THE ALASKA COMMERCIAL CO. STEAMER "ARCTIC" OVAL HANDSTAMP. 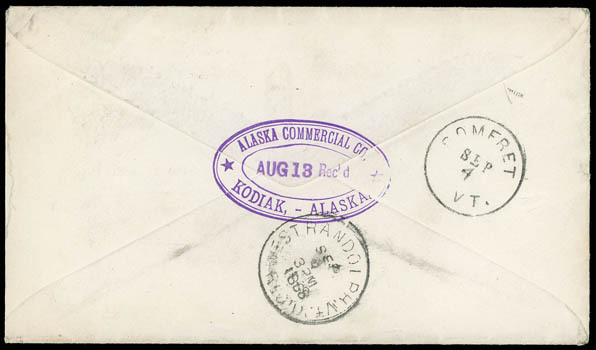 This cover reached San Francisco Aug. 3, 1896 and was delivered to the Alaska Commercial Co. building the following day. It was then placed aboard a company steamer destined for St. Michael. 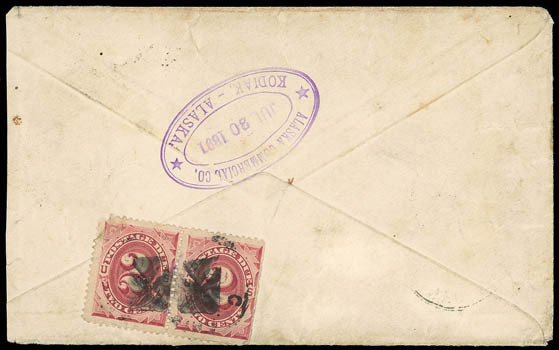 It arrived there September 9 as indicated by the magenta company oval datestamp and placed on board the Yukon River steamer "Arctic" as indicated by the purple oval datestamp. Other envelopes from this same correspondence suggest that the "Arctic" carried this letter to Anvik, a village on the lower Yukon. 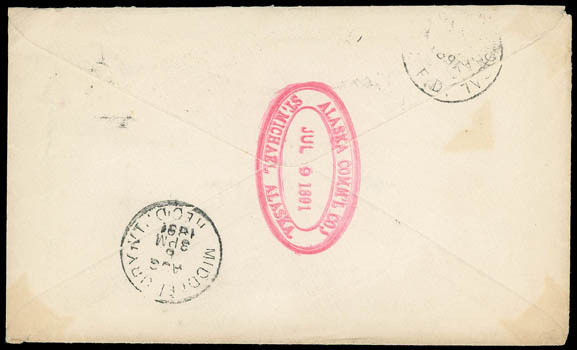 Alaska Comm'l Co., St. Michael, Alaska, Jul 9, 1891, bold magenta oval backstamp on cover to Middlebury Vt bearing 2¢ green (213) strip of three tied by circular grid cancels, matching partial San Francisco F.D. 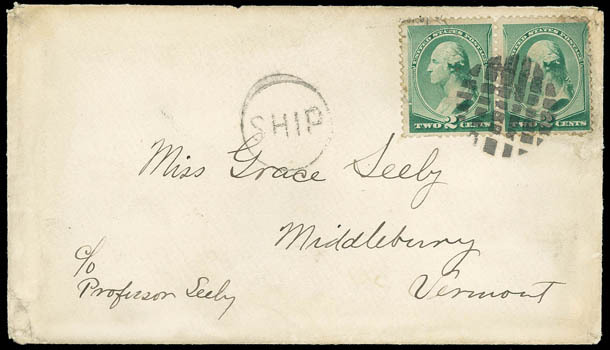 transit backstamp and "Ship 2" due rating handstamp, "Middlebury, Vt. Rec'd Aug 6, 1891" arrival backstamp, barely reduced at right, Very Fine. 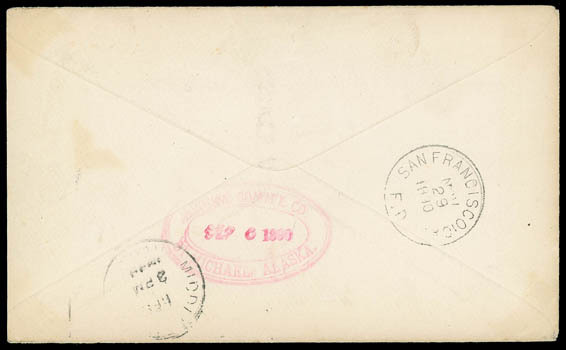 Alaska Commercial Co., Kodiak, - Alaska, Jul 20 1891, purple oval backstamp on cover to San Francisco Cal. with "San Francisco, Cal. F.D. Jul 31 1891" cds and matching bold "Ship 4" due rating handstamp, reverse bearing 2¢ red brown (J16) pair, corner faulty, cancelled by partial cds and cross cancels; cover tears and soiling, Very Fine. 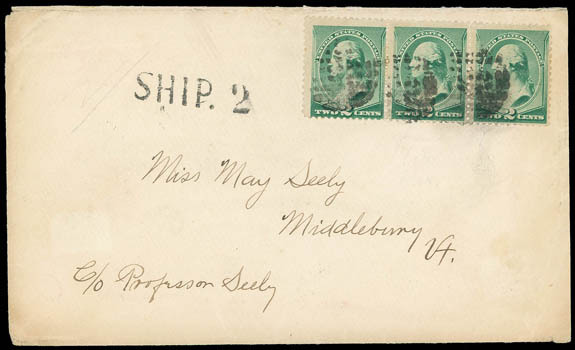 Alaska Comm'l Co., St. Michael, Alaska, Aug 10, 1891, magenta oval backstamp on cover to Middlebury Vt bearing 2¢ green (213) pair, couple flaws, tied by bold circular grid cancel, matching "San Francisco, Cal. F.D. 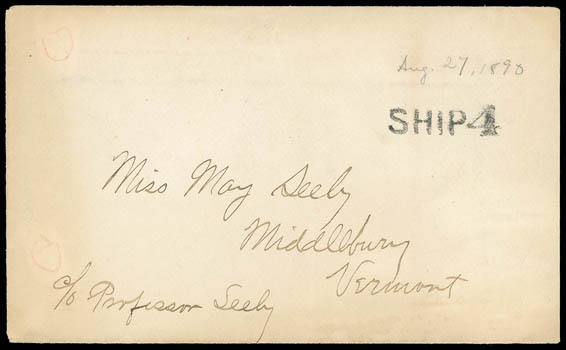 Oct 16 1891" transit backstamp and "Ship" in circle handstamp, "Middlebury, Vt. Rec'd Oct 21 1891" arrival backstamp; some edge wear, Very Fine. 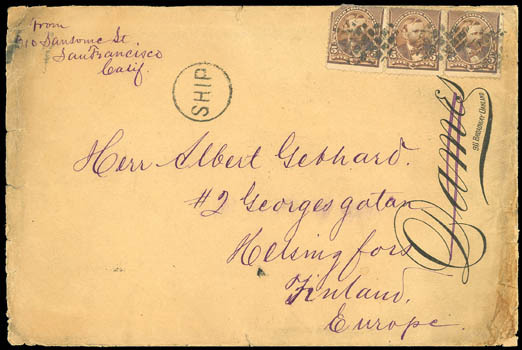 Alaska Commercial Co., Ounalaska, Feb 8 1893, ultramarine oval backstamp on manila envelope to Finland bearing faulty 5¢ chocolate (223) strip of three tied by circular grid cancel, partial "San Francisco, Cal. F.D." 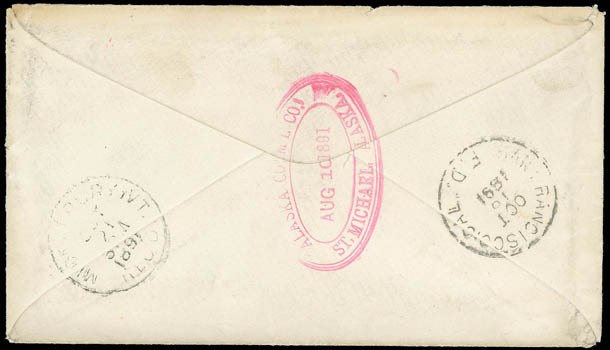 transit backstamp with matching "Ship" in circle handstamp; edge faults, Fine and rare use from Alaska via Ounalaska to Finland.